This article is about the firearms cartridge. For the band, see 38 Special (band). The .38 Smith & Wesson Special (commonly .38 Special, .38 Spl, or .38 Spc, pronounced "thirty-eight special") is a rimmed, centerfire cartridge designed by Smith & Wesson. It is most commonly used in revolvers, although some semi-automatic pistols and carbines also use this round. The .38 Special was the standard service cartridge of most police departments in the United States from the 1920s to the 1990s, and was also a common sidearm cartridge used by soldiers in World War I. In other parts of the world, it is known by its metric designation of 9×29.5mmR or 9.1×29mmR. Known for its accuracy and manageable recoil, the .38 Special remains one of the most popular revolver cartridges in the world more than a century after its introduction. It is used for target shooting, formal target competition, personal defense, and for hunting small game. First model M&P revolver designed in 1899 for the .38 Special cartridge. This particular revolver left the factory in 1900. Except for case length, the .38 Special is identical to the .38 Short Colt, .38 Long Colt, and .357 Magnum. This allows the .38 Special round to be safely fired in revolvers chambered for the .357 Magnum, and the .38 Long Colt in revolvers chambered for .38 Special, increasing the versatility of this cartridge. However, the longer and more powerful .357 Magnum cartridge will usually not chamber and fire in weapons rated specifically for .38 Special (e.g. all versions of the Smith & Wesson Model 10), which are not designed for the greatly increased pressure of the magnum rounds. Both .38 Special and .357 Magnum will chamber in Colt New Army revolvers in .38 Long Colt, due to the straight walled chambers, but this should not be done under any circumstances, due to dangerous pressure levels, up to three times what the New Army is designed to withstand. The .38 Special was designed in 1898 to be a higher velocity round, with better penetration properties than the .38 Long Colt that was in Government Service in the Philippines during the Spanish–American War. The .38 Long Colt revolver round wouldn't penetrate the insurgent Philippine Morro warrior shields, and the Government contracted the new revolver round to Smith & Wesson. The .38 Special held a minimum of 21 grains of black powder, which was 3 grains more than the current .38 Long Colt, and it was 100 to 150 feet per second faster with a 158 grain bullet. 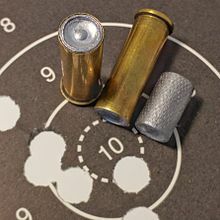 During the late 1920s, and in response to demands for a more effective law enforcement version of the cartridge, a new standard-velocity loading for the .38 Special was developed by Western Cartridge Company. This .38 Special variant incorporated a 200 grains (13 g) round-nosed lead 'Lubaloy' bullet, the .38 Super Police. Remington-Peters also introduced a similar loading. Testing revealed that the longer, heavier 200 grains (13 g) .357-calibre bullet fired at low velocity tended to 'keyhole' or tumble upon impact, providing more shock effect against unprotected personnel. At the same time, authorities in Great Britain, who had decided to adopt the .38 caliber revolver as a replacement for their existing .455 service cartridge, also tested the same 200 grains (13.0 g) bullet in the smaller .38 S&W cartridge. This cartridge was called the .38 S&W Super Police or the .38/200. Britain would later adopt the .38/200 as its standard military handgun cartridge. Smith & Wesson Model 10 in .38 Special produced in 1899. In 1930, Smith & Wesson introduced a large frame .38 Special revolver with a 5-inch barrel and fixed sights intended for police use, the Smith & Wesson .38/44 Heavy Duty. The following year, a new high-power loading called the .38 Special Hi-Speed with a 158 grains (10.2 g) metal-tip bullet was developed for these revolvers in response to requests from law enforcement agencies for a handgun bullet that could penetrate auto bodies and body armor. That same year, Colt Firearms announced that their Colt Official Police would also handle 'high-speed' .38 Special loadings. The .38/44 high-speed cartridge came in three bullet weights: 158 grains (10.2 g), 150 and 110 grains (9.7 and 7.1 g), with either coated lead or steel jacket, metal-piercing bullets. The media attention gathered by the .38/44 and its ammunition eventually led Smith & Wesson to develop a completely new cartridge with a longer case length in 1934—this was the .357 Magnum. During World War II, some U.S. aircrew (primarily Navy and Marine Corps) were issued .38 Special S&W Victory revolvers as sidearms in the event of a forced landing. In May 1943, a new .38 Special cartridge with a 158 grains (10.2 g), full-steel-jacketed, copper flash-coated bullet meeting the requirements of the rules of land warfare was developed at Springfield Armory and adopted for the Smith & Wesson revolvers. The new military .38 Special loading propelled its 158 grains (10.2 g) bullet at a standard 850 ft/s (260 m/s) from a 4-inch (100 mm) revolver barrel. During the war, many U.S. naval and marine aircrew were also issued red-tipped .38 Special tracer rounds using either a 120 or 158 gr (7.8 or 10.2 g) bullet for emergency signaling purposes. In 1956, the U.S. Air Force adopted the Cartridge, Caliber .38, Ball M41, a military variant of the .38 Special cartridge designed to conform to the rules of land warfare. The original .38 M41 ball cartridge used a 130-grain full-metal-jacketed bullet, and was loaded to an average pressure of only 13,000 pounds per square inch (90 MPa), giving a muzzle velocity of approximately 725 ft/s (221 m/s) from a 4-inch (100 mm) barrel. This ammunition was intended to prolong the life of S&W M12 and Colt Aircrewman revolvers equipped with aluminum cylinders and frames, which were prone to stress fractures when fired with standard .38 ammunition. By 1961, a slightly revised M41 .38 cartridge specification known as the Cartridge, Caliber .38 Ball, Special, M41 had been adopted for U.S. armed forces using .38 Special caliber handguns. The new M41 Special cartridge used a 130-grain FMJ bullet loaded to a maximum allowable pressure of 16,000 psi (110,000 kPa) for a velocity of approximately 950 ft/s (290 m/s) in a solid 6-inch (150 mm) test barrel, and about 750 ft/s (230 m/s) from a 4-inch (100 mm) revolver barrel. The M41 ball cartridge was first used in .38 revolvers carried by USAF aircrew and Strategic Air Command security police, and by 1961 was in use by the U.S. Army for security police, dog handlers, and other personnel equipped with .38 Special caliber revolvers. 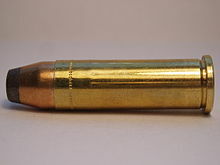 A variant of the standard M41 cartridge with a semi-pointed, unjacketed lead bullet was later adopted for CONUS (Continental United States) police and security personnel. At the same time, .38 tracer cartridges were reintroduced by the US Navy, Marines, and Air Force to provide a means of emergency signaling by downed aircrew. Tracer cartridges in .38 Special caliber of different colors were issued, generally as part of a standard aircrew survival vest kit. A request for more powerful .38 Special ammunition for use by Air Police and security personnel resulted in the Caliber .38 Special, Ball, PGU-12/B High Velocity cartridge. Issued only by the U.S. Air Force, the PGU-12/B had a greatly increased maximum allowable pressure rating of 20,000 psi, sufficient to propel a 130-grain FMJ bullet at 1,125 ft/s (343 m/s) from a solid 6-inch (150 mm) test barrel, and about 950–980 ft/s from a 4-inch (100 mm) revolver barrel. The PGU-12/B High Velocity cartridge differs from M41 Special ammunition in two important respects—the PGU-12/B is a much higher-pressure cartridge, with a bullet deeply set and crimped into the cartridge case. In response to continued complaints over ineffectiveness of the standard .38 Special 158-grain cartridge in stopping assailants in numerous armed confrontations during the 1950s and 1960s, ammunition manufacturers began to experiment with higher-pressure (18,500 CUP) loadings of the .38 Special cartridge, known as .38 Special +P. In 1972, the Federal Bureau of Investigation introduced a new .38 +P loading that became known as the "FBI Load". The FBI Load combined a more powerful powder charge with a 158-grain unjacketed soft lead semi-wadcutter hollow-point bullet designed to readily expand at typical .38 Special velocities obtained in revolvers commonly used by law enforcement. The FBI Load proved very satisfactory in effectively stopping adversaries in numerous documented shootings using 2- to 4-inch barreled revolvers. The FBI Load was later adopted by the Chicago Police Department and numerous other law enforcement agencies. Demand for a .38 cartridge with even greater performance for law enforcement led to the introduction of the +P+ .38 Special cartridge, first introduced by Federal and Winchester. Originally labeled "For Law Enforcement Only",[unreliable source?] +P+ ammunition is intended for heavier-duty .38 Special and .357 Magnum revolvers, as the increased pressure levels can result in accelerated wear and significant damage to firearms rated for lower-pressure .38 Special loadings (as with all .38 Special loadings, the .38 Special +P+ can also be fired safely in .357 Magnum revolvers). .38 Special bullet coming from a Smith & Wesson 686, photographed with an air-gap flash. Due to its black-powder heritage, the .38 Special is a low-pressure cartridge, one of the lowest in common use today at 17,000 PSI. By modern standards, the .38 Special fires a medium-sized bullet at rather low speeds. In the case of target loads, a 148 gr (9.6 g) bullet is propelled to only 690 ft/s (210 m/s). The closest comparisons are the .380 ACP, which fires much lighter bullets slightly faster than most .38 Special loads; the 9×19mm Parabellum, which fires a somewhat lighter bullet significantly faster; and the .38 Colt Super, which fires a comparable bullet significantly faster. All three of these are usually found in semi-automatic pistols. The higher-pressure .38 +P loads at 20,000 PSI offer about 20% more muzzle energy than standard-pressure loads and places between the .380 ACP and the 9 mm Parabellum; similar to that of the 9×18mm Makarov. A few specialty manufacturers' +P loads for this cartridge can attain even higher energies that, especially when fired from longer barrels, produce energies in the range of the 9 mm Parabellum. These loads are generally not recommend for older revolvers or ones not specifically "+P" rated. All of the above specifications for .38 loadings, and the .357 Magnum, are applicable when fired from a 6-inch (150 mm) barreled revolver. The velocity is reduced when using the more standard 4-inch (100 mm) barreled guns. Power (muzzle energy) will, of course, decrease accordingly. Although only a few US police departments now issue or authorize use of the .38 Special revolver as a standard-duty weapon, the caliber remains popular with some police officers for use in short-barreled revolvers carried when off duty or for undercover-police investigations. It is also widely used in revolvers purchased for civilian, home defense or for concealed carry by individuals with a CCW permit. 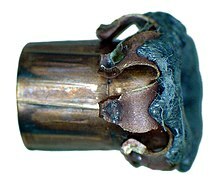 A fired .38 Special hollow-point bullet viewed from the side, showing the intended terminal ballistics sometimes referred to as "mushrooming". There are many companies that manufacture .38 Special ammunition. It can range from light target loads to more powerful defensive ammunition. Because of the relatively low pressure that the .38 Special cartridge and even its more powerful +P version can be loaded to, most 38 Special bullets do not expand reliably, even when using hollow-point designs, especially if fired from a short-barreled or 'snub-nose' revolver. In 2004, Speer Bullets introduced the Gold Dot jacketed hollow-point .38 Special cartridge in an attempt to solve this very problem. Another solution is to use an unjacketed soft lead hollow-point bullet as found in the FBI Load. The latter's 158-grain soft lead hollow point is loaded to +P pressures and velocity, which ensures more reliable expansion in unprotected flesh, even when fired in a 2-inch short-barreled revolver. Various YouTube videos seem to indicate that hollow point 38 Special projectiles (and 380ACP) that have a plastic filler in the concavity achieve more consistent expansion. Some brands call that a 'ballistic tip'. The .38 Special is particularly popular among handloaders. The cartridge's straight walls, headspacing on the rim, ready availability of previously-fired cases, and ability to be fired in .357 Magnum firearms, all contribute to this popularity. Additionally, the .38 Special's heritage as a black powder cartridge gives it a case size capable of accommodating many types of powders, from slower-burning (e.g., Hodgdon H-110 or Hercules 2400) to fast-burning (e.g., Alliant Bullseye, the traditional smokeless powder for this cartridge). This flexibility in powders translates directly to versatility in muzzle energy that a handloader can achieve. Thus, with proper care, a suitably-strong revolver, and adherence to safe handloading practices, the .38 Special can accommodate ammunition ranging from light-recoiling target loads to +P+ self-defense rounds. The .38 Special, handloaded with premium to regular lead bullets can be loaded safely to equal the now popular 9x19mm Luger round, and equal the power of the .45 ACP round. The round is still as viable today as a self-defense round as it was back in 1898. ^ "Federal Cartridge Co. ballistics page". Archived from the original on 26 June 2007. Retrieved 2007-09-25. ^ "SAAMI Pressures". Archived from the original on 21 June 2007. Retrieved 2007-09-25. ^ "SAAMI Pressures". Archived from the original on 16 November 2007. Retrieved 2007-09-25. ^ "Load Data << Accurate Powders". Retrieved 25 September 2007. ^ "Cartridge Loading Data – Hodgdon". Archived from the original on 16 November 2007. Retrieved 2007-09-25. ^ Hogg, Ian (1989). Jane's Infantry Weapons 1989–90, 15th Edition. Jane's Information Group. p. 514. ISBN 978-0-7106-0889-5. ^ Jones, Richard (2009). Jane's Infantry Weapons 2009–2010. Jane's Information Group. p. 621. ISBN 978-0-7106-2869-5. ^ "What are the most popular calibers in the US? - Knowledge Glue". Knowledge Glue. 14 September 2015. Retrieved 23 July 2018. ^ Barnes, Frank C. Ken Warner, editor. Cartridges of the World, 6th Edition. Northbrook, Illinois: DBI Books, 1989. ISBN 978-0-87349-033-7. The failure of the .38 Long Colt as a service cartridge caused the U.S. Army to insist on a .45 chambering for the its 1907 pistol trials. ^ Sharpe, Phil, The New Smith & Wesson Heavy Duty .38, The American Rifleman, November 1931: "..the destruction of this load was terrific..Every shot showed evidence of key-holing after the first half of the penetration had been accomplished." ^ Sharpe, Phil, The New Smith & Wesson Heavy Duty .38, The American Rifleman, November 1931: Chambered in .38 Special, the .38/44 was built on the old S&W .44-calibre Hand Ejector frame. ^ Shideler, Dan, Is This the Greatest .38 Ever, Gun Digest, 4 August 2008: The new .38/44 load developed a maximum allowable pressure of 20,000 pounds per square inch (140 MPa), producing a velocity of about 1,100 ft/s (340 m/s) from a 5 in (130 mm) barrel with a 158 gr (10.2 g) metal-tipped bullet. ^ Ayoob, Massad. "The Colt Official Police: 61 years of production, 99 years of service", Guns magazine. BNET Web site – Find articles. Accessed 2 April 2011: Because of their heavy frames, these revolvers could withstand the higher-pressures generated by the new loadings. ^ The metal-penetrating bullets were often described as Highway Patrol loads. ^ Typically, the FBI Load utilized a very soft lead alloy of 5.5–6 as measured on the Brinell hardness scale to ensure reliable expansion. ^ "Wayback Machine". 19 August 2014. ^ a b "Miscellaneous Questions". www.frfrogspad.com. ^ "Federal Ammunition - 38 SPL 148GR LEAD WC MATCH". www.federalpremium.com. ^ Ballistics By The Inch .38 special results. Wikimedia Commons has media related to .38 Special. Ballistics By The Inch .38 special results.